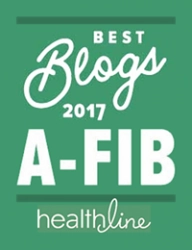 The A-Fib.com glossary of medical terms and phrases is the most complete online source devoted exclusively to Atrial Fibrillation and is the largest single source online. 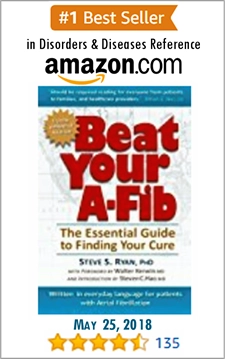 Bookmark this page and refer to it when reading and studying A-Fib research and literature. If you don’t find the term you are looking for—email us and we’ll add it to the Glossary. To physically destroy tissue or isolate by applications of RF, Cryo, laser, or ultrasound energy. A procedure designed to use energy to disrupt or eliminate the faulty electrical pathways that cause abnormal heart rhythms; done through catheters placed into the heart through the blood vessels. Abbreviation of “Activated Coagulation Time.” Used to measure the effect of high dose heparin before, during and shortly after surgeries which requires intense anticoagulation. ACT is measured in seconds. The higher it is, the higher the degree of clotting inhibition. When a heart cell goes from a negative resting value to a positive value—when a heart cell fires. Atrial fibrillation which usually occurs during the day and is normally triggered by exercise, stress, stimulants, exertion, etc. ; related to adrenaline (epinephrine), a hormone and neurotransmitter. Any undesirable experience associated with the use of a medical product in a patient. Serious adverse events include: death, disability or permanent damage, congenital anomaly/birth defect and required intervention to prevent permanent impairment or damage. Brand name Cordarone. An antiarrhythmic drug (Class 3). A type or method of Pulmonary Vein Ablation (Isolation) developed by Dr. Carlo Pappone. Also called “Left Atrial Ablation.” It creates blocking lesions in the left atrium similar to “Circumferential” ablation. A large diameter catheter at a high wattage is dropped and dragged to make the circular linear lesions around the Pulmonary Veins. A ballooning out of a blood vessel or of a portion of the heart muscle. If the aneurysm ruptures, it can be deadly. Chest pain caused by reduced blood flow to the heart. Medications (such as Aspirin, Plavix, Ticlid) which help prevent blood clots and stroke. An antiplatelet works by decreasing the stickiness of circulating platelets (small blood cells that start the normal clotting process), so that they adhere to each other less and are less likely to form blood clots. The heart valve between the Left Ventricle and the Aorta. The Left Ventricle pumps oxygenated blood through the tricuspid (three flapped) Aortic Valve into the Aorta which carries it to the rest of the body. When pressure in the Left Ventricle drops, the pressure of blood in the Aorta will push the Aortic Valve closed. Having an abnormal heart beat: too fast is called Tachycardia, too slow is called Bradycardia, or irregular is called Fibrillation. Drug therapy that attempts to stop A‑Fib and make the heart beat normally. A chemical used by cells as an energy carrier. It transports chemical energy within cells for metabolism. Abnormal duct or passage in the esophagus wall formed after RF heat damage which is later eroded by gastric acids allowing blood from the heart to leak into the esophagus; a very rare complication (less than one in over 1000 cases) that can be fatal. A heart rhythm disorder in which the upper chambers of the heart contract (quiver) very rapidly and irregularly (as many as 300-600 times a minute) due to chaotic, uncoordinated electrical activity usually originating in the left atrium; a type of supraventricular arrhythmia. A heart rhythm disorder in which the upper chambers of the heart (the atria) contract faster than the lower chambers (the ventricles) in an organized, predictable pattern. (In Atrial Fibrillation the atria beat chaotically and irregularly.) You can consider Atrial Flutter as a more regular variety of A-Fib. A-Flutter often, though not always, originates in the right atrium, whereas A-Fib usually comes from the left atrium. A powerful vasodilator and a hormone secreted by heart muscle cells in the upper chambers (atria) of the heart. It reduces the water and sodium loads on the circulatory system. It is released in response to atrial stretch and other signals such as atrial fibrillation. A rhythm disturbance in the atria of the heart. An electrical impulse comes from somewhere in the atria other than from the SA Node which is the normal pacemaker of the heart. In A-Fib Ablation, Atrial Tachycardia can be considered a milder form of Atrial Flutter. A surgical device to close off the left atrial appendage (LAA) and reduce the risk of stroke; an alternative to suture or staples. Specialized conducting tissue in the right atrium where the atrial and ventricular electrical systems meet; acts as an electrical road or gate connecting the atria to the ventricles; normally the AV Node is the only electrical connection between these heart chambers. The AV Node develops two pathways instead of one, allowing a signal to go down one pathway, then back up the other pathway to the atrium (reentrant circuit) resulting in Supraventricular Tachycardia (speeding up the heart beat). Either one of the two upper chambers of the heart in which blood collects before being pumped into the lower chambers (ventricles). See Atrioventricular (AV) Nodal Reentry Tachycardia. A medication that slows down conduction through the heart and makes the AV Node less sensitive to A-Fib impulses. Refers to both Exit Block and Entrance Block, goals of a successful A-Fib ablation. Signals from both inside and outside the Pulmonary Vein can not cross the ablation lesions. A two-to-three month recovery period before determining if your ablation was successful. Antithrombotic medications which don’t actually thin the blood. Rather they inhibit the ability of substances in blood to form clots. Bachelor of Medicine, Bachelor of Surgery. Awarded on graduation from medical school in various countries which follow the tradition of the United Kingdom. (Like an MD.) BCh stands for Bachelor of Surgery (in Latin). A heart rhythm problem in which the heart beats slower than normal. Bradycardia may be caused by the SA Node not working properly or by the electrical pathway in the heart being blocked (heart block). A medication that prevents or slows the flow of calcium ions into smooth muscle cells such as the heart. This impedes muscle cell contraction, thereby allowing blood vessels to expand and carry more blood and oxygen to tissues. A specialist in finding, treating and preventing diseases of the heart and blood vessels; often referred to as the “plumber” of the heart. A heart condition or disease in which the heart muscle is weakened and the heart’s ability to pump blood is impaired. For example, fibrous tissue may partially replace the heart muscle, disabling the heart so that it no longer functions properly, and blood no longer moves efficiently. Cardiomyopathy is often accompanied by atrial fibrillation. A technique that temporarily takes over the functions of the heart and lungs during heart surgery, maintaining the circulation of blood and the oxygen content of the body; commonly referred to as a heart-lung machine. Converting the heart from A-Fib to normal rhythm by using medications and/or electrical shock. An A-Fib mapping system that uses a special catheter to generate 3-D maps of the heart. A soft, thin, flexible tube about the diameter of a piece of spaghetti (long, thin pasta); For catheter ablations, the tip is equipped with an electrode. A procedure in which a catheter (a soft, thin, flexible tube with an electrode at the end) is inserted through a vein in the groin and moved into the heart; through this electrode, RF or Cryo energy is applied to specific heart tissue to create scars to “ablate” or “isolate” A‑Fib signals..
Short for Computed Axial Tomography—a method of producing 3-D images by recording the passage of waves of energy through structures. In the Right Atrium this is the space between the Inferior Vena Cava and the Tricuspid Valve. In ablation for Right Atrial Flutter, a Caviotricuspid Isthmus ablation line is often made to prevent Atrial Flutter. Certified Cardiac Device Specialist. Designates an EP who has passed an exam for cardiac devices such as pacemakers. The exam is given by the International Board of Heart Rhythm Examiners (IBHRE) affiliated with the Heart Rhythm Society. This credential may not be totally relevant to A-Fib ablation. Complex Fractionated Atrial Electrograms (an electrogram is a picture of the electrical activity of the heart as sensed by a pacemaker or catheter in the heart). They are low voltage electrical signals with very short cycle lengths used to identify areas in the heart that need to be ablated. For example, someone with a risk factor of 1 not receiving any anticoagulant therapy would have 1.9%-2.8% chance of having a stroke within a year, whereas someone with a score of 6 would have an 18.2% chance of having a stroke. A European refinement of the CHADS2 identifying more risk factors for stroke. People with a score of 1 can be treated with aspirin or oral anticoagulant, but preferably oral anticoagulant. People with a score of 2 or above should be treated with oral anticoagulant. Low risk people with a score of 0 don’t need blood thinners. This risk factor model recognizes that women have a significant risk of stroke. Any woman 65 or over should be on anticoagulants. Note: There is some controversy about the increased stroke risk for females. For opposing opinions, see the footnotes in the article, The CHADS2 Stroke-Risk Grading System. In chronic A-Fib the heart remains in A-Fib all the time, as contrasted with “paroxysmal” A-Fib where the heart has occasional attacks of A-Fib. A Catheter Ablation technique that utilizes a catheter to make circular lesions around the Pulmonary Vein openings, thereby isolating the Pulmonary Veins from the rest of the heart. This prevents A-Fib pulses produced in the Pulmonary Veins from spreading through the rest of the heart. A type of Pulmonary Vein Ablation. Sodium Channel Blocker medications which decrease the speed of electrical conduction in the heart muscle. Beta-Adrenergic or Beta-Blocker medications which slow down conduction through the heart and make the AV Node less sensitive to A-Fib impulses. Potassium Channel Blockers which slow nerve impulses in the heart. Calcium Channel Blockers which prevent or slow the flow of calcium ions into smooth muscle cells such as the heart. This calcium blocking impedes muscle cell contraction, thereby allowing blood vessels to expand and carry more blood and oxygen to tissues. A low voltage A-Fib signal with many deflections and irregular spiking and often with a very short cycle length. Discovered by Dr. Nademanee, they are used to identify sources of A-Fib in the heart. The heart is unable to pump adequate amounts of blood, often as a result of a heart attack. A symptom or condition that makes a particular treatment, drug or procedure inadvisable. Plaque accumulates in the coronary arteries limiting the flow of blood to the heart. CAD sometimes results in a blood clot that causes a heart attack. An open-heart operation creating extensive linear incisions on the left and right atria to electrically isolate A‑Fib signals to defined paths to the AV Node. Developed by James Cox, MD, in the mid–1980s. Also called “cut and sew maze” or traditional Maze. An open-heart surgery in which the surgeon makes numerous lesions in the atria to isolate A‑Fib signals; the current version of the classic Cox-Maze surgery. The newest refinement of the Cox-Maze; most of the “cut and sew” incisions are replaced with linear ablation lesions created either with radiofrequency energy or cryothermal energy. A marker or sign of inflammation, often found in patients with A-Fib. An ablation technique that “freezes” the focal sources of A‑Fib rather than destroying them with RF energy. A type of “cold” energy used to form lesions or scar tissue in catheter ablation and surgical ablation; works by withdrawal of heat (versus the addition of cold). Dabigatran is a direct thrombin inhibitor, a newer type of blood thinner medication. Dabigatran does not require close monitoring. An electrical device that delivers a shock in order to restore the heart to normal rhythm. It is used primarily in life threatening conditions to stop very rapid and irregular heartbeats. Delayed-Enhancement-Magnetic Resonant Imaging. DE is also called Data-Enhancement. An MRI process which uses a metallic Gadolinium dye to see in 3D and identify collagen fibrotic areas in the heart. Docosahexaenoic Acid, a fish oil/omega-3 fatty acid that plays a crucial role in brain function, as well as in normal growth and development. The optimal blood pressure reading currently is 115/75. The “75”, the second number, is the Diastolic Blood Pressure—the amount of pressure in your arteries when your heart is at rest between beats. A rate-control medication that is a Digitalis compound, brand name Lanoxin. Digoxin slows down and controls the heart rate by blocking the electrical conduction between the atria and ventricles. A class of medication that acts as anticoagulants (delaying blood clotting) by directly inhibiting the enzyme thrombin; Thrombin converts soluble fibrinogen into insoluble strands of fibrin that then form a mesh or clot over a wound. A rate-control calcium-channel blocker medication. Brand name Norpace. An antiarrhythmic drug (Class 1A). Brand name Tikosyn. An antiarrhythmic drug (Class 3). Medicines that attempt to stop A-Fib and make the heart beat normally. Refers to A-Fib in those younger than 60 years old when diagnosed. An imaging technology in which special sound waves are bounced off of the structures of the heart. A computer converts these images into moving pictures. Beats that come from any region of the heart that ordinarily should not produce heart beat signals. Normal heartbeats come from the Sinus Node, not from areas like the Pulmonary Vein openings where most A-Fib signals originate. Effective Refractory Period (ERP) refers to the period of time a cell can not be activated by a new action potential. The ERP acts as a protective mechanism in the heart by preventing multiple, compounded action potentials from occurring (i.e., it limits the frequency of depolarization and therefore heart rate). This is important because at very high heart rates, the heart would be unable to adequately fill with blood and therefore ventricular ejection would be reduced. The ratio of the volume of blood the heart pumps out during contraction to the volume of blood in the heart when it fills up with blood. It is expressed as a percentage normally between 56 and 78 percent. Delivering an electrical shock to the heart in order to convert it from A-Fib to normal rhythm. A graphical representation of the electrical activity of the heart. Up to 12 sensors placed on different parts of the body record electrical activity from different areas of the heart. An Electrocardiogram will show if you are in A-Fib at the time of the EKG, and sometimes show where an arrhythmia signal is coming from. It is also used during an ablation procedure to determine if an A-Fib signal source has been ablated/isolated. A test which uses a catheter inserted through the veins into the heart to determine which areas in the atria give rise to Atrial Fibrillation or Flutter. When a signal can not enter a pulmonary vein isolated by catheter ablation lesions. This is a goal of a successful A-Fib ablation, along with Exit Block. Entrance and Exit Block are called Bidirectional Block. 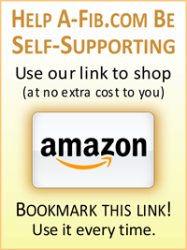 Eicosapentaenoic Acid, a fish oil/omega 3 essential fatty acid. A rate control beta-blocker medication. A portable type of EKG that is patient-triggered. At the onset of an episode of A-Fib, the patient pushes a button to record the past several minutes of the A-Fib episode. Some Event (Loop) monitors sense abnormal heart rhythms and start automatically. It’s called a Transtelephonic Monitor if you call in and transmit the signals you recorded. An A-Fib signal is blocked by ablation lesions from leaving the pulmonary veins and affecting the rest of the left atrium. This is a goal of a successful A-Fib ablation, along with . Entrance and Exit Block are called Bidirectional Block. Outside the cell, in contrast to intracellular (inside the cell). A premature contraction of the heart, resulting in momentary interruption of the normal heartbeat. Also called premature beat, premature contraction. Fellow of the American College of Cardiology. Designates a Cardiologist who has completed a minimum of ten years of clinical and educational preparation and passed a rigorous two-day exam given by the American Board of Internal Medicine. It’s not an absolute requirement for an EP, but most EPs have passed this Cardiology Board exam. Fellow of the Heart Rhythm Society. Not an academic title and not limited to physicians. Membership is based on peer review. Designates heart rhythm professionals working in the field of electrophysiology and/or pacing, provided that the majority of their time is not devoted to marketing and/or sales. Most EPs in the US with FHRS credentials have also achieved FACC. Internationally this may not be the case. Rapid, uncoordinated contractions of individual heart muscle fibers. Fiber-like characteristics that develop in place of the normal smooth walls of the heart making you more vulnerable to A‑Fib. Not limited to the atria; may occur in the SA node and the AV Node (often leading to Sick Sinus Syndrome). Fibrotic tissue is scarred, immobile, basically dead tissue with reduced or no blood flow and no transport function. It results in a loss of atrial muscle mass. Over time it makes the heart stiff, less flexible and weak, overworks the heart, reduces pumping efficiency and leads to other heart problems. Fibrosis is considered permanent and irreversible. Based on medical guidelines of protocols, the doctor’s typical first choice of treatment. Brand name Tambocor. An antiarrhythmic drug (Class 1C). A special type of X-ray that allows the heart to be visualized on a computer screen. Rapid, organized contractions of individual heart muscle fibers. A-Fib coming from a particular spot in the heart. See also Reentrant Circuit. Early version of Pulmonary Vein Isolation; pioneered in the mid–1990s by Dr. Michel Haïssaguerre of Bordeaux, France. A procedure in which a catheter (a soft, thin, flexible tube with an electrode at the tip) is inserted through a vein in the groin and moved into the heart. This catheter is directed to the exact point(s) in the heart that are producing the A-Fib. These points are burned off or isolated from the heart. U.S. government agency that regulates pharmaceutical drugs and medical devices. The liquid portion of human blood that has been frozen and preserved quickly after a blood donation. In cases where someone with A-Fib is taking a blood thinner like Coumadin and is in a serious accident with extensive bleeding, FFP is administered which has clotting factors to stop the bleeding. The heart beats too slow (bradycardia) because something causes the AV Node to delay or prevent the electrical signal from traveling from the atria to the ventricles. Term used to describe A‑Fib and cardiac admissions during or after weekends or holidays when more alcohol is consumed (binge drinking). A small, portable monitor that continually records the heart’s rhythm for 24-72 hours. An antiarrhythmic drug (Class 3). Short for Intracardiac Ultrasound (Echo) which uses Ultrasound to image within the heart in real time. An implanted electronic device which delivers a shock to the heart any time it senses the heart going into A-Fib. It is also used in patients who have V-Tach (Ventricular Tachycardia). Inside the cell, in contrast to extracellular (outside the cell). Important when testing for mineral levels, Magnesium, for example. The intracellular level of Mg can be deficient while the blood serum test (extracelluar level) indicates a normal level of magnesium. A measurement of the time for your blood to clot. When on warfarin (Coumadin), your INR is determined by a prothrombin time test (PT). If necessary, your doctor will adjust your warfarin dosage to maintain an INR between 2.0 and 3.0. An INR above 4.0, you run the risk of having a hemorrhagic (bleeding) stroke. Below 2.0, you are more in danger of having an ischemic (clotting) stroke, the kind that most often occurs in A-Fib. Using Ultrasound to image within the heart in real time. A catheter ablation technique that creates lesions (cuts or scars) around a source of A‑Fib to keep it from transmitting A‑Fib signals into the rest of the heart. 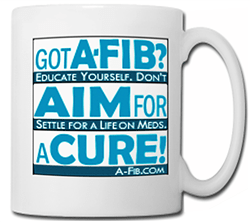 If a source of A‑Fib area is “isolated,” it is still producing A‑Fib signals, but they aren’t getting out (spreading) to the rest of the heart. A drug used to stimulate the heart into A-Fib during a Pulmonary Vein Ablation procedure. A remote “noose-like” suture delivery system from SentreHeart inserted from outside the heart to close off the Left Atrial Appendage (LAA) and minimize the risk of stroke. It is an alternative to taking blood thinners such as Coumadin (warfarin). A very complicated structure located at the top of the Left Atrium.. Most strokes come from the Left Atrial Appendage (91%).87 In A-Fib, blood flow from the LAA is particularly poor. Clots can easily form, dislodge and cause stroke. In the first trimester or two of our time in the womb, The Left Atrial Appendage (LAA) was originally our left atrium (LA). When the final real Left Atrium (LA) formed gradually from the conjunction and evolutionary development of the four pulmonary veins, the actual LA chamber grew and ballooned out, pushing the smaller remnant LA to the upper top left of the Left Atrium where it became known as the Left Atrial Appendage (LAA) with its own functions and behaviors. In surgery: cuts made with a scalpel (i.e. traditional Cox-Maze); In surgical and catheter ablations: cuts or scars created electronically. The ligament of Marshall (LOM) is located on the epicardium between the left atrial appendage and the left pulmonary veins. Marshall muscle structures can serve as a source of non-PV triggers and drivers for A-Fib, and may be an underlying cause of recurrence of A-Fib after a catheter ablaltion. A vestige of a vein that was required during fetal development, but is no longer needed. Describes A‑Fib in younger patients (below the age of 60), with no identifiable cause in an otherwise healthy patient; the arrhythmia is the “lone” abnormality present; usually paroxysmal (infrequent) A‑Fib. When the heart remains in A‑Fib continuously for over a year, as contrasted with Paroxysmal A‑Fib or Persistent A‑Fib (formerly referred to as Permanent or Chronic A‑Fib). MRI scanners use strong magnetic fields to form images of the body. Drug therapy that attempts to stop A-Fib and make the heart beat normally. A measurement of radiation dose used for measuring the effects of various types or radiation. 1 Sievert equals 1.0 joule/killogram or 100 rem. A Sievert is defined as producing the same biological effect in a specific tissue as 1 gray of high-energy x-rays. A variation of the Cox‑Maze IV; replaces the “open chest” access (through the breast bone) with small incisions between the ribs. A “keyhole” operation performed on a beating heart without opening the chest, focused on isolating the pulmonary veins; a modification of the Maze Surgery. Variations include the Wolf Mini-Maze, the Totally Thoracoscopic (TT) Maze, Five‑Box Thoracoscopic Maze and the Dallas Extended Lesion Set. The part of a cell responsible for the production of energy in the form of ATP. The heart valve between the Left Atrium and the Left Ventricle. Oxygenated blood from the four Pulmonary Veins flows into the Left Atrium and through the Mitral Valve into the Left Ventricle. When the Left Ventricle pumps this blood into the Aorta and the rest of the body, the pressure of this blood pushes against the two folds or cusps of the Mitral Valve to close it. Bachelor of Medicine, Bachelor of Science. Awarded on graduation from medical school in various countries which follow the tradition of the United Kingdom. (Like an MD.) BCh stands for Bachelor of Surgery (in Latin). A total blockage of blood flow and oxygen to a portion of the heart which damages the heart’s muscle cells. NOAC stands for Novel Oral AntiCoagulants. NOACs are alternatives for vitamin K antagonists (e.g. Warfarin) for stroke prevention in patients with atrial fibrillation. The normal beating of the heart (60–100 beats per minute); also called Sinus Rhythm. Outside of licensed indication—the clinical application of prescribed drugs for indications other than those approved by the FDA. Off-label uses are legal and may be in the best interests of patients. But they have not received the same degree of independent scrutiny through randomized clinical trials as have approved indications. The opening from a pulmonary vein into the left atrium. A small, implantable device that provides an electrical stimulus to the heart when the natural electrical signal is absent or too slow to provide sufficient pumping action. The Parasympathetic Nervous system controls the heart, smooth muscles and glands of the head and neck, and thoracic, abdominal, and pelvic viscera. It’s in control during periods of digestion and rest. Some research indicates a raised parasympathetic tone can lead to arrhythmias. The Sympathetic Nervous System enables the body to rise to emergency demands encountered in flight, combat, pursuit, and pain. It enervates and stimulates the body. Occasional attacks of A-Fib that return to normal heart rhythm (sinus rhythm) on their own, as contrasted with Persistent A-Fib or Long-standing Persistent A-Fib. Inflammation of the sac that surrounds the heart (the pericardium). Often refers to patients where a decision has been made not to pursue restoring the heart to normal rhythm by any means including catheter or surgical ablation. A-Fib that lasts more than a week, or that lasts less than a week but requires cardioversion to return to normal sinus rhythm. For Paroxysmal A-Fib patients. When an A-Fib attack occurs, the patient takes an antiarrhythmic med (flecainide, propafenone) to return to normal sinus rhythm. A variation of the Pill-In-The-Pocket treatment is to take an antiarrhythmic med on a regular basis, then take a higher dose at the time of an A-Fib attack. 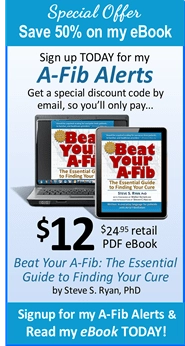 A-Fib that lasts over 24 hours but that is amenable to cardioversion. A consumer device for monitoring one’s pulse rate. Designed primarily for runners, it consists of a band worn around the chest which transmits a signal to a special wrist watch. The watch can be set to sound an alarm if the runner’s pulse rate goes too high. Has been used by patients to detect their A‑Fib episodes. Available in sporting goods stores. Atrial fibrillation which arises during or soon after cardiac surgery; generally, it stops by itself, but sometimes the patient may require treatment. Brand name for dabigatran. Dabigatran is a direct thrombin inhibitor, a newer type of medication. Dabigatran does not require close monitoring and has less bad side effects than warfarin. It is expected to replace warfarin as the blood thinner of choice for A-Fib. Premature beats that occur in the atria (the heart’s upper chambers) are called premature atrial contractions, or PACs. Premature beats that occur in the ventricles (the heart’s lower chambers) are called premature ventricular contractions, or PVCs. In a normal, healthy heart premature beats happen naturally and are considered benign. However, some heart diseases can cause them. They can also be caused by stress, caffeine, nicotine, or too much exercise. A medication is “proarrhythmic” if it worsens your heart rhythm rather than making it more regular. Brand names Procan SR, Promine, Pronestyl, Procanbid. An Antiarrhythmic drug (Class 1C). Brand name Rythmol. An antiarrhythmic drug (Class 1C). A blood test to measure how long it takes for your blood to clot. Used when taking warfarin (Coumadin). The measurement of clotting is your International Normalized Ratio (INR) score. A normal ratio is between 2.0 and 3.0. With an INR above 4.0 you run the risk of having a hemorrhagic (bleeding) stroke. Below 2.0 you are more in danger of having an ischemic (clotting) stroke, the kind that most often occurs in A-Fib. The heart valve between the Right Ventricle and the Pulmonary Artery. The Pulmonary Valve opens as deoxygenated blood is pumped out of the right ventricle into the Pulmonary Artery to flow into the lungs to be oxygenated. When pressure in the Right Ventricle drops, the pressure of blood in the Pulmonary Artery will push the Pulmonary Valve closed. One of four veins that brings oxygenated blood from the lungs into the left atrium. (The openings from these Pulmonary Veins into the left atrium are the source of most A‑Fib signals). Catheter Ablation procedure to isolate A-Fib signals by ablating the openings around the pulmonary veins. Also called Pulmonary Vein Isolation (PVI). A Pulmonary Vein Isolation strategy in which the pulmonary vein openings are ablated in pairs with very wide lesions in the Antrum rather than near the vein openings. Catheter ablation procedure to isolate A-Fib signals by ablating the openings around the pulmonary veins. Also called Pulmonary Vein Ablation (PVA). An electrical charge or energy (potential) in the Pulmonary Veins that can cause A-Fib. A PV Potential can be measured and pinpointed even if the patient isn’t in A-Fib at the time. A medical device that monitors the oxygen saturation of a patient’s blood. Most monitors also display the heart rate. Swelling of the Pulmonary Vein opening that may occur after Catheter Ablation. This swelling can restrict blood flow from the lungs into the heart. Brand names Quiniglute, Quinidex, Quinidine Glaconate. An antiarrhythmic (Class 1A) drug. See Treatments/Medications. In an EKG signal the QT interval represents the time the ventricles are pumping and at rest. In an EKG signal the QTc Interval represents the time the ventricles are pumping and at rest corrected or adjusted for movement of the heart when beating. High frequency electrical energy used to form lesions or scar tissue in catheter and surgical ablations. The newest refinement of the classic Maze surgery, sometimes called the Cox Maze IV. It replaces the surgeon’s scalpel and “cut and sew” incisions with linear lesions (scars) created either with radiofrequency energy (heat) or cryo energy (freezing). Drug therapy that attempts to control your heart rate (ventricular beats), but leave the upper chambers (atria) of your heart in A-Fib. A term used to describe A-Fib during the first 48-72 hours of occurrence. Return of symptoms of a disease. Circular, random electrical patterns or wavelets found in the Atria of patients with A-Fib and A-Flutter. In A-Fib over a period of time, the fast, abnormal heart rhythm in the atria causes electrical, contraction, and structural changes to the heart, including enlargement of the atria and the development of Atrial Fibrosis. Rotors (rotational circuits) are underlying drivers that sustains or propagates an A-Fib signal after it has been triggered (like an echo); Multiple rotors may be present during A-Fib; Elimination of rotors by catheter ablation improves long-term freedom from Atrial Fibrillation. Drug therapy that uses rhythm control drugs, called antiarrhythmics, to try to stop A-Fib and make the heart beat normally. Registered Vascular Technologist. Must pass two exams given by the American Registry for Diagnostic Medical Sonography. A Pulmonary Vein Isolation strategy that uses Pulmonary Vein Potentials to identify and ablate (destroy) focal points or areas of the heart producing A‑Fib signals. A thin membrane separating the right and left atria; during a PVI procedure, the septum wall is pierced to allow the catheter to advance from the right atrium into the left atrium. Atrial Fibrillation in which the patient feels no or very few symptoms; often discovered only during a routine medical exam. The normal beating of the heart (60–100 beats per minute); Also called “Normal Sinus Rhythm,” (NSR). A spline has a series of projections on a shaft that fit into slots on a corresponding shaft. A spline is used on a catheter to insert the Watchman device. A swelling, constriction or narrowing of a duct or passage. See PV Stenosis. A rare but potentially significant complication after RF catheter ablation (also seen after surgical approaches using multiple lesion burns in the left atrium). The ability of the left atrium to contract is compromised which also causes pulmonary hypertension, shortness of breath, and congestive heart failure. There are two main types of strokes: hemorrhagic and ischemic. Hemorrhagic stroke is caused by a leaking or ruptured blood vessel in the brain. More common is the ischemic stroke caused by a clot in the brain that constricts or blocks off blood supply. A-Fib related strokes are most often Ischemic. One of several different structural defects in the heart including heart muscle disease (cardiomyopathy), heart valve disease, congenital heart disease (patients born with abnormalities of the heart valves or chambers), and heart damage caused by infection, such as Pericarditis. An arrhythmia similar to A-Fib in which the heart beats fast (100 to 240 beats per minute). SVT usually begins and ends suddenly. SVT often begins in childhood or adolescence. It is commonly caused by a variation in the electrical system of the heart. It is usually not dangerous, but can cause a drop in blood pressure and lightheadedness. In practice, Supraventricular Tachycardia is often used to include all arrhythmias in the Atria, including A-Fib. The Sympathetic Nervous System enables the body to rise to emergency demands encountered in flight, combat, pursuit, and pain. It enervates and stimulates the body. The Parasympathetic Nervous system controls the heart, smooth muscles and glands of the head and neck, and thoracic, abdominal, and pelvic viscera. It’s in control during periods of digestion and rest. The optimal blood pressure reading currently is 115/75. The “115”, the first number, is the Systolic Blood Pressure—the pressure your heart generates when pumping blood through your arteries. See Diastolic Blood Pressure. A heart rate that exceeds the normal resting rate, usually over 100 beats per minute. Heart rates above the resting rate may be normal (such as with exercise) or abnormal (such as with electrical problems within the heart). Also called tachyarrhythmia. Blood or fluid collects in the pericardium, the sac around the heart. This pressure can prevent the heart from beating and feel like one is being strangled. Doctors need to drain this fluid or blood from the pericardium. 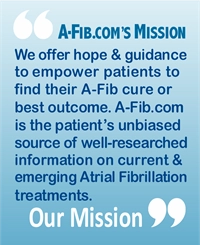 During a catheter ablation, when the sources of A-Fib signals are successfully ablated, the A-Fib stops or ‘terminates’ and the heart returns to normal sinus rhythm. Sometimes though, the A-Fib doesn’t ‘terminate’, so doctors use cardioversion to get the heart back into normal sinus rhythm. This test is typically performed to help diagnose the cause of dizziness and fainting. The individual is placed on a table that tilts. The table then creates a change in posture from lying to standing. Heart rate and blood pressure are monitored during the test. “Twisting of the Points or Spikes.” An uncommon type of ventricular tachycardia. It can be the result of lengthing the QT interval. The outline on an EKG can look like a twisted ribbon with upward then downward pointing ventricular complexes. If they persist, they can degenerate into ventricular fibrillation which can lead to sudden death. Lesion or scar that passes through or completely penetrates the entire thickness of the atrial wall (heart tissue). Test for the presence of blood clots in the heart; a tube is run down the esophagus next to the heart; the echocardiogram uses high-frequency ultrasonic waves from within the esophagus to visualize structural and functional abnormalities of the heart. The heart valve between the right atrium and the right ventricle. The right atrium receives deoxygenated blood, then pumps it into the right ventricle through the Tricuspid Valve. This valve then closes as the right ventricle pumps this deoxygenated blood into the Pulmonary Artery. The pressure of the blood being pumped out of the right ventricle closes the three curved flaps or cusps of the Tricuspid Valve. High-frequency sound vibrations used in some types of Catheter Ablation to produce images of the heart and vessel structure. Measures and classifies the amount of fibrosis in the heart, an indicator of the progression of A-Fib. 3D delayed-enhancement magnetic resonance imaging (DE-MRI) reveals the degree of fibrosis in the left atrial myocardial tissue. Stages: Utah Stage 1 (minimal); Utah Stage 2 (mild); Utah Stage 3 (moderate); and Utah Stage 4 (extensive). Developed by the University of Utah (CARMA). A form of A-Fib that occurs at night, after a meal, when resting after exercising or when you have digestive problems; related to the Vagal nerve. Impulses from the Vagus nerve inhibit and slow the heartbeat. The lower chambers of the heart. A fast heart rhythm that originates in one of the ventricles. It is a potentially life-threatening arrhythmia, because it may lead to Ventricular Fibrillation—very rapid uncoordinated fluttering contractions of the ventricles resulting in loss of synchronization between heartbeat and pulse beat. Unlike A-Fib, it can be very dangerous and result in sudden death. A rate control calcium-channel blocker medication. A technical description of how VKAs work is the following: “they prevent the y-carboxylation of the vitamin K-dependent coagulation factor prothrombin and Factors VII, IX, and X.”115 In layman’s terms warfarin blocks vitamin K, thereby affecting several steps in the anticoagulation pathway and decreasing clotting proteins in the blood. It inhibits vitamin K-dependent coagulation factors. The generic name of an anticoagulant whose product name is “Coumadin.” Warfarin is a Vitamin K-Antagonist which works by blocking vitamin K. thereby inhibiting vitamin K-dependent coagulation factors and decreasing clotting proteins in the blood. The Watchman Device closes off the Left Atrial Appendage (LAA) where 90-95% of A-fib strokes come from. It may replace the need for blood thinners. A version of the Mini-Maze surgery for A-Fib developed by Dr. Randall Wolf, MD. A form of Supraventricular Tachycardia, WPW occurs when electrical signals fail to pause in the AV Node because an extra pathway allows the impulse to “bypass” the normal pathway. Patients with WPW may develop A-Fib and are at increased risk of developing a dangerous ventricular arrhythmia.